Revenue in the Prestige Cosmetics & Fragrances segment amounts to US$2,013m in 2019. The market is expected to grow annually by 1.2% (CAGR 2019-2023). The market's largest segment is the segment Prestige Cosmetics with a market volume of US$782m in 2019. In global comparison, most revenue is generated in United States (US$14,430m in 2019). In relation to total population figures, per person revenues of US$43.35 are generated in 2019. Prestige Cosmetics and Fragrances are comprised of Prestige Skin Care, Fragrances and Decorative Cosmetics. Skin care products constitute the bulk of sales with roughly 50 percent of all sales revenues. With a high share of licensed designer and celebrity-themed products, prestige beauty products stand out from the other luxury segments covered here due to their relative affordability. The overall market definition is aligned with the Consumer Market Outlook’s Cosmetics and Personal Care market, while here only the super- and ultra-premium range is considered, and hair care, oral care and personal hygiene products are excluded. Likewise, professional products produced for hair salons or cosmetic parlors are not included. Covered are only product sales and no beauty services. L’Óréal’s Luxe division (with brands such as Lancôme and Biotherm), Estée Lauder (Aramis, Clinique, MAC and other brands) and LVMH’s perfume and cosmetic brands (e.g. Givenchy, Benefit) as well as Coty’s Luxury and Shiseido’s Prestige divisions are the most important players in this field. The American company Coty has been expanding aggressively across luxury and consumer segments over the last years with their latest acquisition of more than 40 beauty brands by Procter & Gamble, bringing on board for example the fragrance licenses for Hugo Boss and Gucci. Burberry’s cosmetics division was also acquired by Coty in late 2017, although it is still listed here independently. An important sales driver in cosmetics, especially fragrances, are licenses from established fashion brands. Coty, for instance, holds licenses for Burberry, Calvin Klein, Gucci, Hugo Boss and Balenciaga among others, while Estée Lauder currently licenses Ermenegildo Zegna, Michael Kors, Tommy Hilfiger and Tory Burch, and L’Óréal markets cosmetics and fragrances under the Armani, Yves Saint Laurent and Valentino brands. All sales of licensed products are attributed only to the licensee to avoid double-counting of revenues. Reading Support Revenue in the Prestige Cosmetics & Fragrances segment amounts to US$2,013m in 2019. 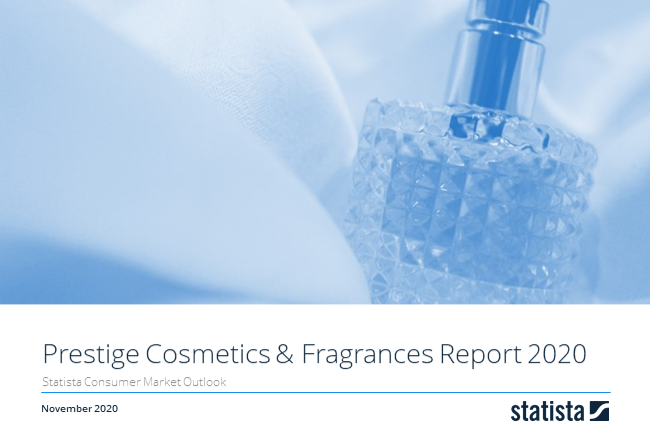 Reading Support The Prestige Cosmetics & Fragrances segment is expected to show a revenue growth of 1.3% in 2020. Reading Support Products of brands held by Estée Lauder amount to an estimated 34.6% of the Luxury Goods market in the selected segment and region in 2019. Reading Support The average revenue per person in the market for Prestige Cosmetics & Fragrances amounts to US$43.35 in 2019. Reading Support With a market volume of US$14,430m in 2019, most revenue is generated in United States. Here you can find more studies and statistics about "Prestige Cosmetics & Fragrances".